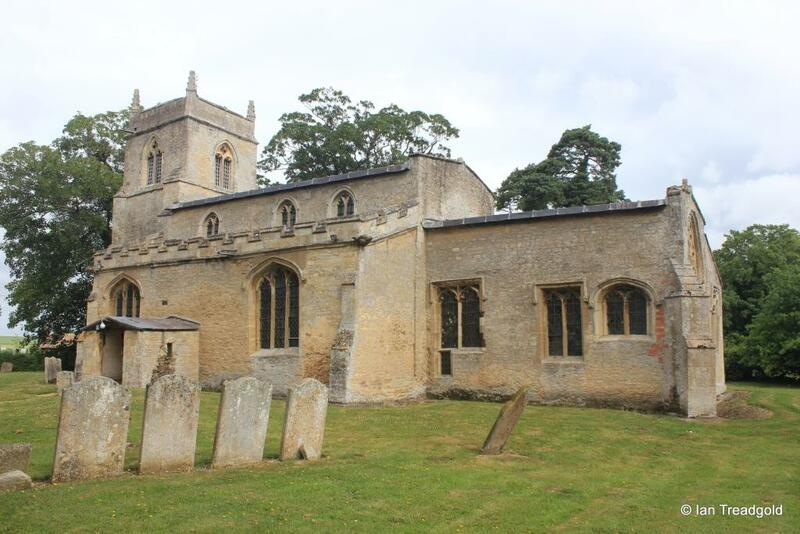 The church of St Mary the Virgin in Shelton is the most northerly parish church in Bedfordshire and is situated to the south-west of the centre of the hamlet of Shelton. 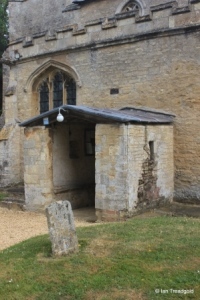 Parking is available by the roadside outside the church. 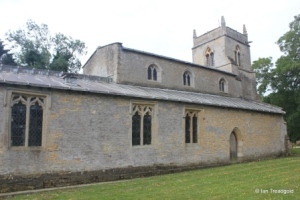 The church consists of a nave and chancel, north and south aisle with a north chapel alongside the chancel, a south porch and west tower. 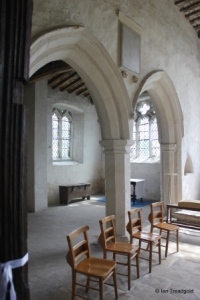 The chancel is around 24 feet by 12 with the nave adding some 36 feet. 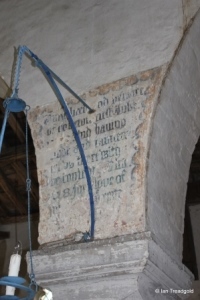 The north aisle is around 9 feet and the south around 8 feet wide. The tower is around 8 feet square and some 46 feet high. 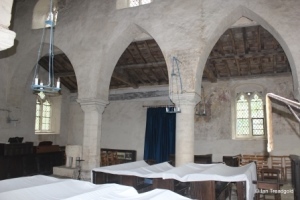 Although there has been some restoration work over the years, the basic appearance of the church is much as it must have been during the early parts of its life. Many of the windows appear askew and almost ramshackle but add to the feeling of history within the building. The oldest surviving part of the original church are the two eastern bays of the north arcade which date from C12. 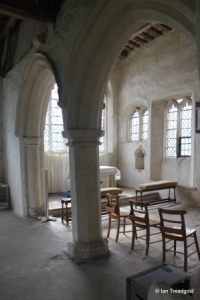 During C13 the chancel was rebuilt and the south aisle added during this time. The north chapel and west tower were added during C14 with the clerestory being added in C15. 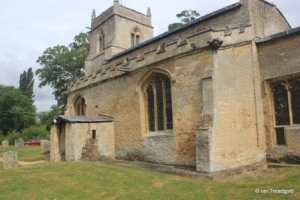 Little happened in terms of restoration and renovation until around 1930 when thorough and very necessary work was undertaken to save what had become a rather dilapidated building. 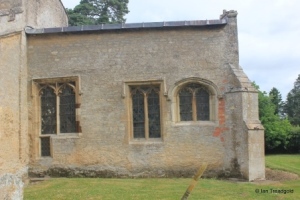 The south aisle has two windows surrounding the south porch. The clerestory above has three unequally spaced windows, each of two cinquefoiled lights under two-centred arches with a quatrefoil design in the head. 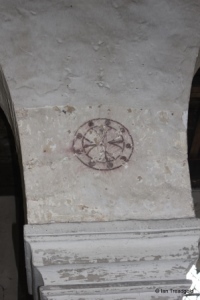 Both are of three cinquefoiled lights under four-centred arches and date from C15. 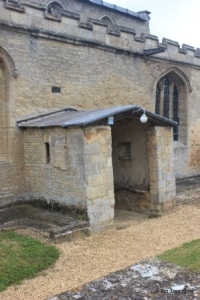 The south porch dates from around 1200 and is a plain affair with low roof with two simple square headed lights to north and south. 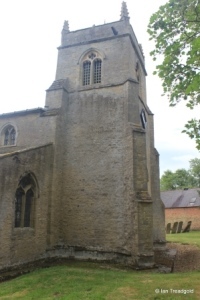 The west tower is in two stages with buttresses to the north and south at the east end and diagonal buttresses to the west. 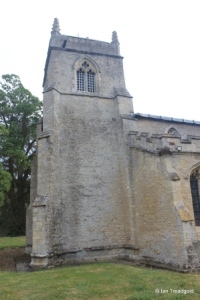 The tower has a plain parapet and diagonally set pinnacles in the corners. 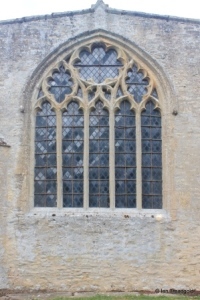 The west window is of two trefoiled lights with a quatrefoil design above under a two-centred arch. 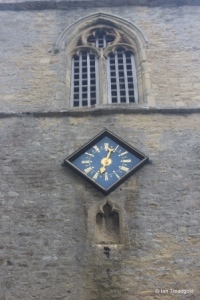 Above is an empty statue niche and a single-handed clock, the face of which dates to 2005. 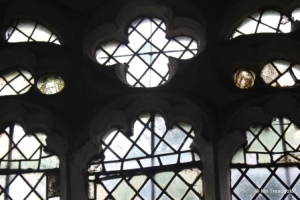 The belfry lights are of two trefefoiled lights under two centred arches with quatrefoil designs in the head. 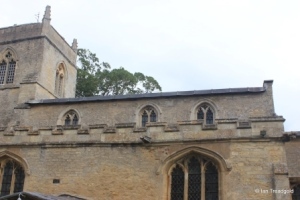 The tracery above the lights to the south is ogee shaped rather than the more rounded tracery of the other three. 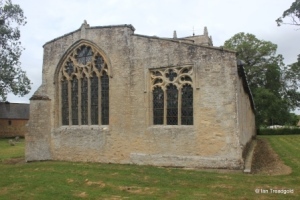 The north wall of the aisle and chapel has three windows, all to the east of the north door. 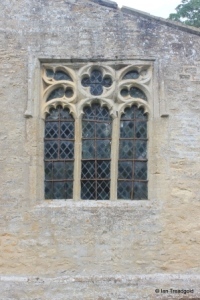 The western of these windows is in the aisle and the other two are in the north chapel. 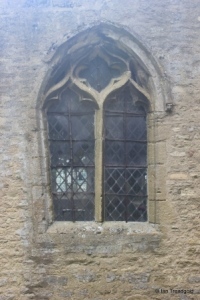 There is also a west window to the north aisle. 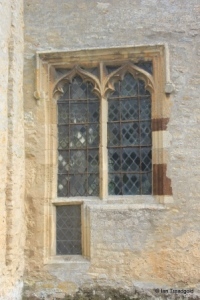 The west window to the aisle shows some of the traits of many of the windows with question marks about the concept of vertical and horizontal masonry. 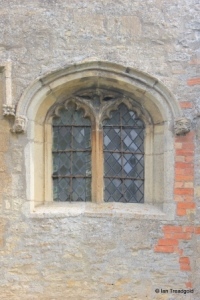 The window is of two trefoiled lights with a quatrefoil design above under a two-centred arch. 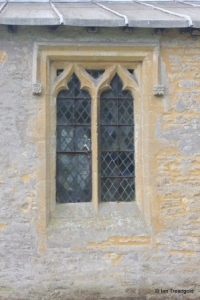 The north aisle window has two ogee headed trefoiled lights under a square head. 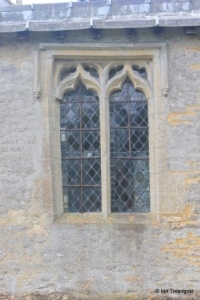 The two north chapel windows are similar but with more ornate tracery above. 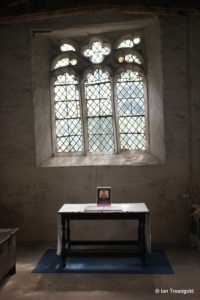 The east windows of the north chapel and chancel are quite flamboyant when compared to the rest of the windows of the church. 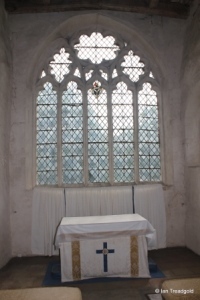 The east window of the north chapel dates from C14 with its tracery restored and is of three cinquefoiled lights with flowing tracery above under a square head. The east window of the chancel is also from C14 with five trefoiled lights with tracery above containing three octofoil designs, two elongated and one effectively circular under a two-centred arch. 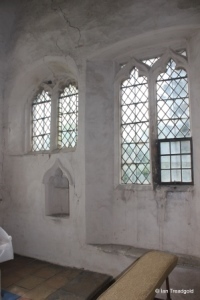 The south side of the chancel has three windows which together show the signs of reworking over the years. 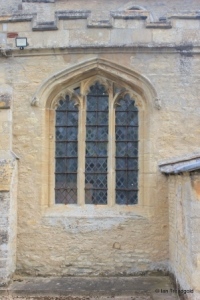 The eastern window appears to be an insertion after the building of the chancel and has two cinquefoiled lights under a four-centred arch. 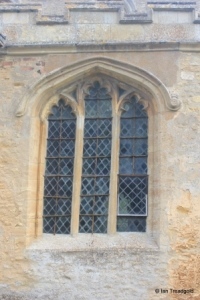 The window is hard against its neighbour which dates from C14 two trefoiled lights under a square head. 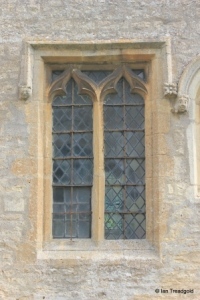 The western window of the three is also under a square head with two wide cinquefoiled lights. 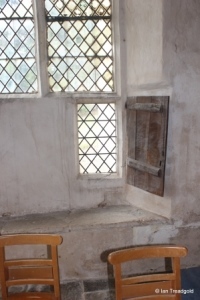 Below is a window with an oak shutter thought to be a leper’s window through which mass could be observed without infecting the other worshippers. 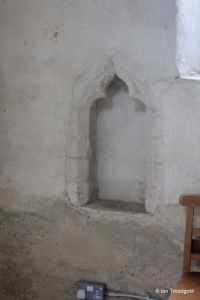 At the east end of south aisle there is a piscina which would indicate an altar here at one time. 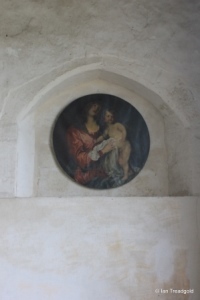 The east end has no windows but there is a niche which contains a copy of van Dykes “Madonna and Child” . The south-east corner of chancel also has a piscine and, under the central window of the south side of the chancel, a sedilia. 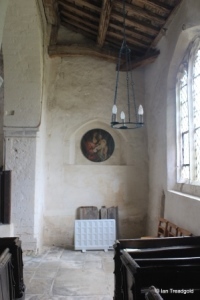 The chancel is separated from the chancel by an arcade. 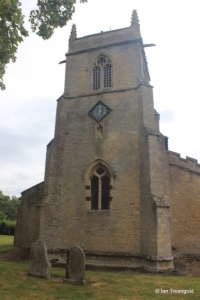 The chapel was used as a vestry until around 1956 with the vestry now under the tower. 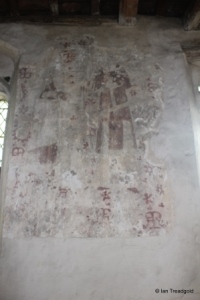 There are the remnants of medieval paintings throughout the church. 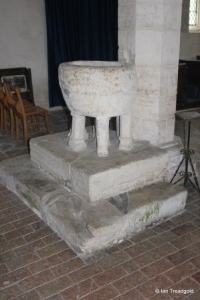 The font may date from C14 but style of basin indicates Saxon origins with four C14 stone shafts supporting the basin. The north arcade shows the difference between the two eastern arches and the western indicating where the arcade was either extended or rebuilt. 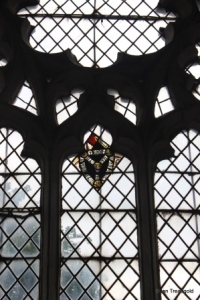 In various of the windows there are small fragments of medieval glass.